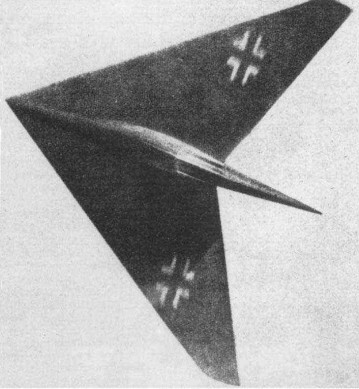 The H X was a high speed arrow shaped flying wing inspired by Busemann’s statement in 1936 of the beneficial effect of sweepback on delay of the shock stall. This apparently cheered up the Horten brothers and gave them new proof that they were working on the right lines. Initial work on the H X consisted of experiments with flying models of 10 ft length weighing about 8-10 kg. From these they deduced the CG position needed for satisfactory flight with low aspect ratio and high sweepback, and found that they got good results with 4 degree dihedral and no fin area. The next step was a man carrying glider model weighing 400 kg. The wing section was a symmetrical D.V.L. low drag type with maximum thickness at 45% chord. Wing washout was 12 degrees, dihedral 4 degree. Small Frise nose elevons were fitted but no flaps; a trimmed CLmax of 0.8 was expected with a stalling incidence of 20 – 25 degrees. Rudder control was to be by wing tip “trafficators”. The undercarriage was of tricycle layout giving zero ground incidence but clearance for a 15 degree nose up attitude at takeoff; the front wheel was to be retractable but the rear wheels fixed. Work on the glider H X was in progress at Hersfeld. On June 4, 1945 it was being used as an M.T. servicing depot and all aircraft components had been dumped in a basement. Only one wing rib and the main spar could be found. All drawings and calculations had gone. After an exploration of low speed control problems on the glider, the next step was to have been a power version with an Argus AS 10C pusher engine. The final development was envisioned as a jet propelled aircraft, with the same general dimensions, weighing 6-7,000 kg. A single H 11 jet engine was proposed and a top speed of 1,200 kph was expected with 1,300 kg thrust; the thrust was to be improved to 1,500 kg. Initial tests on control effectiveness with high sweep were carried out on the H XIII to guide the control design for the H X. No ideas for controls on the final version had emerged but Horten said he intended to stick to Frise nose balance as long as it would work. In general appearance the H X bears resemblance to the Lippisch designs for high speed and supersonic aircraft, particularly the P 13. Horten said he had not heard of Lippisch’s work in Vienna until he came to London. The main difference in design is that Hortens think a fin unnecessary whereas Lippisch favors a very large one.